Tag-Copter: the nano sensor with wings! The Tag-Drone can be interpreted as a sensor with flying capability in order to highlight that only elementary UAV features are expected. The Tag-Drone may be used in standalone mode or according to the more fascinating swarm configuration (like bees) cooperatively collecting information within a same environment. Tag-drones should have small size so that they could be referred to the technology of micro-drones. 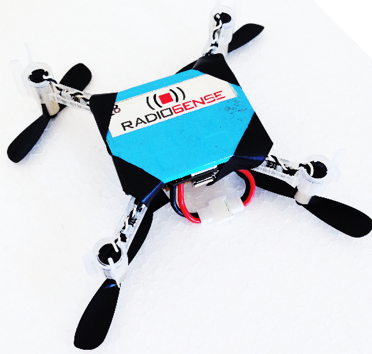 The Reader-Drone system consists of a suitable UAV hosting an autonomous RFID reader to act as mobile scanner of the environment. The drone can be manually or automatically remotely driven to approach tags displaced on a surface and retrieve sensed data. Sampled data may be stored on-board for a later-time recovery when the drone comes back, or may be instead transmitted in real time to a fixed base station placed in radio visibility with the drone itself. iv) the need to quickly approach the tags from a remote distance. 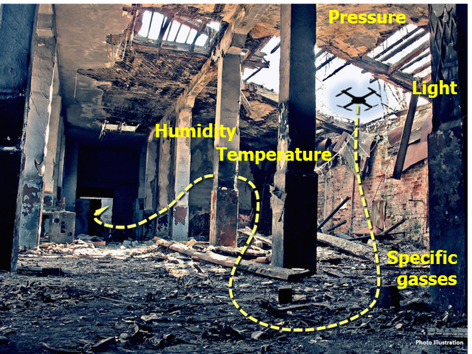 The concept of Reader-Drone’s footprint is related to the ability of an Reader-Drone framework to detect sensors over the surface of interest in the shortest possible time in order to comply with its limited power autonomy.